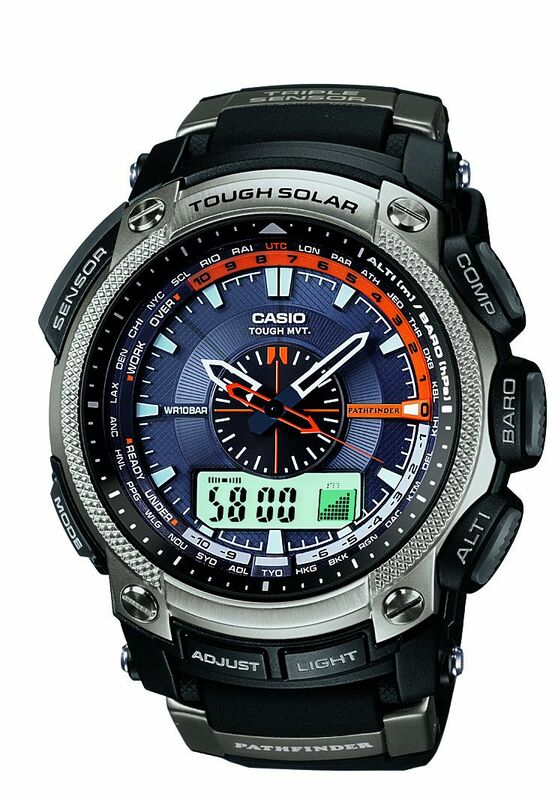 Casio America, Inc. announced today that it has been named as an International CES Innovations 2011 Design and Engineering Awards Honoree for the newest upgrade to its popular Pathfinder watch line, the PAW5000. Products entered in this prestigious program are judged by a preeminent panel of independent industrial designers, engineers and members of the media to honor outstanding design and engineering in cutting edge consumer electronics products across 35 product categories. Equipped with Casio’s one-touch triple sensor technology, the PAW5000 includes a digital compass, altimeter, barometer and thermometer, making this the all-in-one tool necessary for high energy, rugged, outdoor adventures. The PAW5000 has a unique second hand that acts as a compass needle, altitude and barometric pressure differential indicator, while the hour and the minute hands are specially designed with cut-outs for greater visibility of the dial underneath which assists with reading the digital display and dial indexes. With a resin band, the watch provides a lightweight feel offering durability and comfort on every trip. The prestigious Innovations Design and Engineering Awards have been recognizing achievements in product design and engineering since 1976. It is sponsored by the Consumer Electronics Association (CEA)®, the producer of the International CES, the world’s largest consumer technology tradeshow. Casio’s PAW5000 will be displayed at the 2011 International CES, which runs January 6-9, 2011 in Las Vegas, Nevada. The Innovations Design and Engineering Showcase will feature honorees by product category in the Grand Lobby of the Las Vegas Convention Center and will also be featured at CES Unveiled: The Official Press Event of the International CES on Tuesday, January 4. Products chosen as Innovations honorees reflect innovative design and engineering of the entries. Examples may include the first time various technologies are combined in a single product or dramatic enhancements to previous product designs.